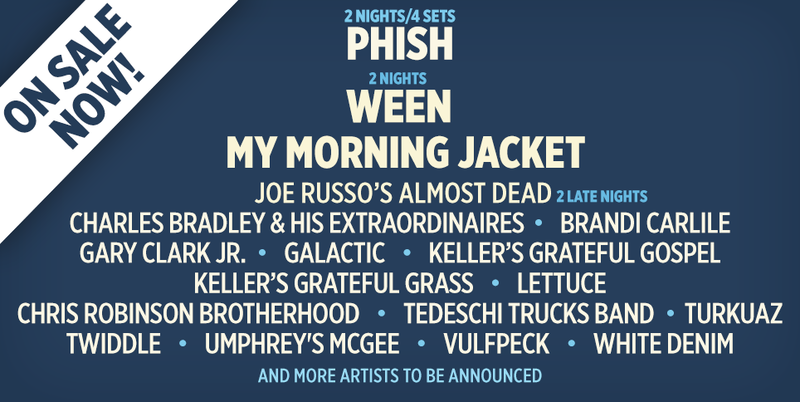 LOCKN’ is very proud to announce the lineup for its fourth annual event. Phish will be making its first appearance at the festival with a two-night, four-set headlining slot on the Friday and Sunday of the weekend. This will mark the band’s only festival performance in 2016. To add to the once-in-a-lifetime experience, Ween, who are fresh off three reunion shows in Broomfield, CO that sold out instantly, will perform right before Phish on the Friday night. Another LOCKN’ first timer, the beloved My Morning Jacket will headline on the Saturday night. Also performing is an eclectic collection of some of the best live acts in the scene today, including: Joe Russo’s Almost Dead on two different nights, Charles Bradley & His Extraordinaires, Brandi Carlile, Gary Clark, Jr., Galactic, Keller’s Grateful Gospel, Lettuce, Chris Robinson Brotherhood, Tedeschi Trucks Band, Turkuaz, Twiddle, Umphrey’s McGee, Vulfpeck and White Denim. An array of additional artists will be unveiled soon. The four-day camping festival will take place from August 25-28 on the same beautiful Oak Ridge Farm in Arrington, VA.
General Admission and VIP tickets for LOCKN’ 2016 will go on sale this Friday, February 19 at 12 noon ET via http://www.locknfestival.com, as will on-site camping, RV and hotel and shuttle packages. LOCKN’ 2016 will take place August 25-28 and will henceforth take place on this final August weekend. The new dates will allow festival attendees greater access to hotels and RV rentals while easing stress on local government agencies, service providers, and the labor force required to put on such an epic event. Along with its emphasis on musical invention and environmental sustainability, LOCKN’ also features an array of other activities, from on-site camping, locally sourced food, and craft beer to lifestyle events, biking and hiking tours, daily yoga, SoberLockn’, family camping, and much more. LOCKN’ is also home to Participation Row, a Social Action Village that serves as host and hub for a variety of non-profits, facilitating action and other involvement by LOCKN’ Festivalgoers. Participation Row at LOCKN’ is sponsored by Qello Concerts, the largest streaming library of live concerts and music documentaries. Widely praised by fans and media for being among the best run and uniquely creative festivals in the country, LOCKN’ 2016 is picking up where the 2015 event left off as it featured one of the most extraordinary bills in the festival’s history with a line-up that saw several legendary artists performing two unique shows over two days, including Robert Plant and the Sensational Space Shifters, Widespread Panic, The String Cheese Incident, Tedeschi Trucks Band, Gov’t Mule, Phil Lesh & Friends (featuring special guest Carlos Santana). Among LOCKN’ 2015’s other once-in-a-lifetime artist collaborations were “‘Mad Dogs & Englishmen: A Tribute to Joe Cocker,”‘ hosted by Tedeschi Trucks Band and featuring original band members Leon Russell and Rita Coolidge with Dave Mason, Chris Robinson, and Doyle Bramhall II, and “‘Jorma Kaukonen and Jack Casady Celebrate 50 Years of Jefferson Airplane,”‘ featuring Rachael Price (of Lake Street Drive), GE Smith, Larry Campbell, Teresa Williams, and others. The String Cheese Incident partnered with The Doobie Brothers as “‘The Doobie Incident”‘ presenting the legendary band’s classic catalog in an unforgettable one-set-only performance. In its history, LOCKN’ has also hosted Tom Petty & The Heartbreakers, Willie Nelson, Wilco and many others. From inception, LOCKN’ quickly established itself as a national festival on par with the best in the country. Now, with the announcement of LOCKN’ 2016’s initial lineup, the festival continues to raise the bar for incomparable large scale creative programming as it cements its reputation as one of the premiere American concert events of the summer.